I grew up in the Lehigh Valley, not far from Allentown. I had spent the majority of the past six years in Colombia, Missouri while I completed my PhD at the University of Missouri. Since returning home in the middle of August, I’ve been immersing myself in a variety of activities to catch up with what is going on in the area. My return to the area has allowed me to explore and think of the Lehigh Valley from a literary prospective. I began my undergraduate career as a major in historic preservation and had long been interested in history. It has never been alien for me to think about my home and its relationship to the past, but now I have the opportunity to reflect on this community from the perspective of my previous years of graduate work in literature. This fall, my partner came to visit. It was her first trip to the Lehigh Valley. In searching for things to see and do it made sense to visit Bethlehem. 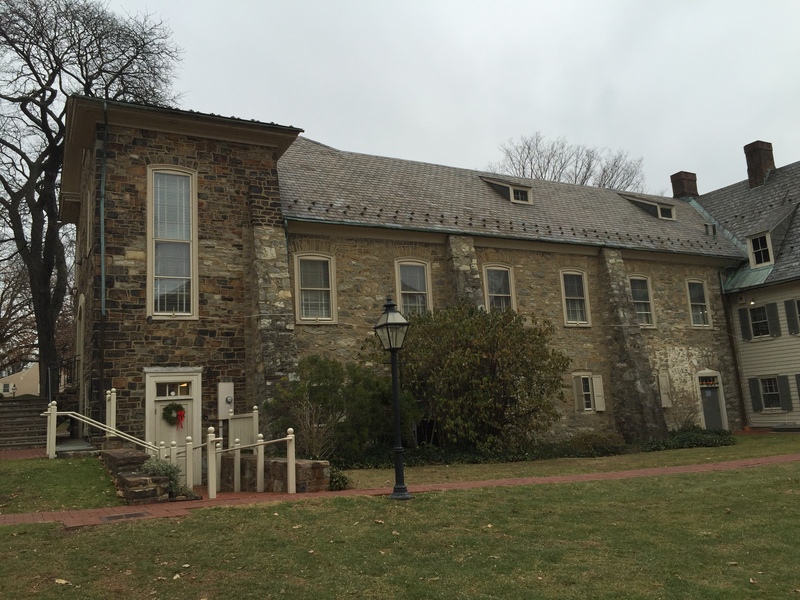 We could go to the Moravian Book Shop and see some of the many historical sites related to the Moravians. I thought that would appeal to my partner because one of her areas of study is Methodism and the British novel. The choice of visiting Bethlehem made sense, since as my partner pointed out there were many connections between the Methodists and the Moravians. What I didn’t expect to find in Bethlehem was something that would be very curious me as a scholar of American literature. Many of the historic sites in Bethlehem were closed that particular day; that fact meant spending a lot of time outside walking around the closed buildings. For me, one of the most fascinating sites was the Old Chapel, one of the earliest locations of Moravian worship in Bethlehem. It is a stout, but unassuming structure built of stone. While the building was interesting architecturally, what captured my attention was a commemorative plaque on the outside of the building. The plaque, placed in 2001, marked the 250th anniversary of the building of the chapel. As commemorative plaques go, it is rather standard in what it appears to commemorate. It begins by noting the number of luminaries of the American Revolution that attended worship services in the Old Chapel. The plaque also notes that “in 1792 fifty-one chiefs and warriors from the Iroquois Confederacy visited the chapel.” In many ways the plaque is reflective of the early 2000s and the legacy of the cultural and canon wars of the 1970s, 1980s, and 1990s that helped to expand our notions of what we study and how we mark and commemorate it. 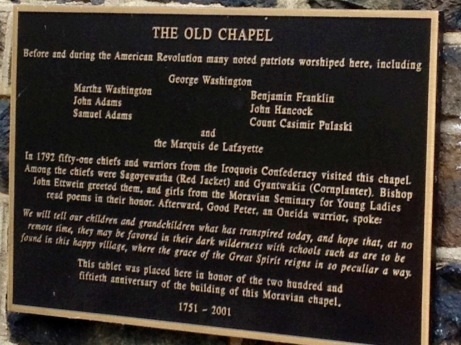 The plaque captures a diverse history with its reference to Martha Washington and the members of the Iroquois Confederacy whose histories interacted with the Old Chapel. However, it is not surprising that the Moravian Church would chose to commemorate and mark the moment when the “chiefs and warriors” visited the Old Chapel. The Moravians were long active with engaging the Native American populations in locations where they established communities. As a scholar of American literature interested in the circulation of texts, what captured my attention about the plaque were the additional details beyond the history that we usually expect to be recorded on such a marker. During the visit of the members of the Iroquois Confederacy, the plaque noted that “girls from the Moravian Seminary for Young Ladies read poems in their honor.” I found this small detail a curious event to record for many reasons. It seems insignificant and minor compared to the historical moments and figures mentioned on the plaque. And, on the surface, the short phrase about the poetry does not reveal a great deal about this particular moment when chiefs and warriors came to visit. That single sentence about the reading of poetry is sparse in details, but it communicates a great deal to us today. The sentence reveals that these young women wrote and read poetry specifically written to commemorate this event. At least one of the modes that these unnamed women write in is the genre of the occasional poem. We can also infer that those that hosted the Iroquois Confederacy and organized this gathering valued poetry enough to make a reading of poems part of the event. 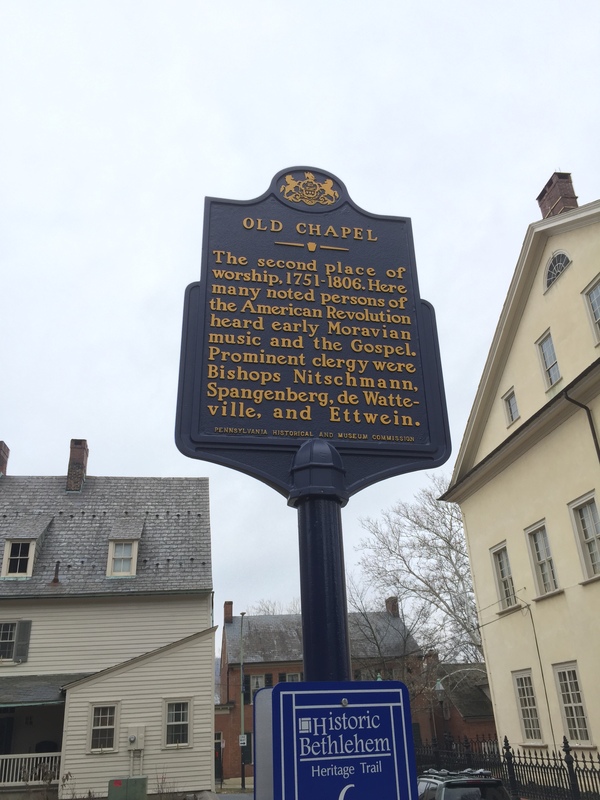 The content of the plaque on the Old Chapel is also striking compared to the Pennsylvania Historical and Museum Commission marker a few yards away from the entrance of the Old Chapel. Like many state historical markers of the type, it is crafted on the great man theory of history recording that “here many noted persons of the American Revolution heard early Moravian music and the Gospel.” It is also notes many of the prominent religious leaders of the Moravians including “Bishops Nitschmann, Spangenberg, de Watteville, and Ettwein.” The sign is a record of a male history and records the history of the Old Chapel site in relation to the larger event of the American Revolution. Granted, PHMC markers aren’t meant or able to draw attention to the more focused moments of history, but its lack of recognition of early American women’s history is striking compared to the nearby marker on the Moravian Chapel. It is not surprising that the PHMC marker follows the great man theory of history; the marker was dedicated in 1953. I have questions about the past and I have many questions about those that put up the Old Chapel plaque in the early 2000s. First, why was this particular detail about the poetry reading recorded? It seems minor in the scheme of things considering the mention of individuals associated with the American Revolution, the Iroquois Confederacy, and the many Moravian luminaries at the time. What is the historical memory of those that placed this plaque? Is this occasion of reading poetry a moment recorded in the historical record or the archives? What was the decision process for the creation of the text of the plaque? While I am curious about the creation of the plaque and what it reveals about how we thinking of women’s writing in the past, I’m also curious about the “girls from the Moravian Seminary for Young Ladies.” Who were they? What did they write in these particular poems? Do the poems still exist? If the poems don’t exist, what is in the historical record that recorded that particular moment of the reading of these poems? Beyond this specific historical moment, I also want to know about the role of poetry in the Moravian Seminary for Young Ladies, specifically circulating poetry shared among the young women. What did they write? For whom did they write? Are these poems in German or English? Do these poems still exist in the archive? I hope the answers for many of these questions can be found in the Moravian Archives and other local archives. I hope this is the case, because I am fascinated by these one moment recorded on an historical marker. While many of my questions seek to uncover a past event and its greater context, I am also curious about what the placement of the plaque says about its moment in time and its creators. The phrase about the poetry reading says a great deal about those that put up this particular plaque in 2001. The incident of the poetry reading struck those that placed this plaque as a moment of history to record and present for today. It is not surprising that this moment was recorded on the plaque. 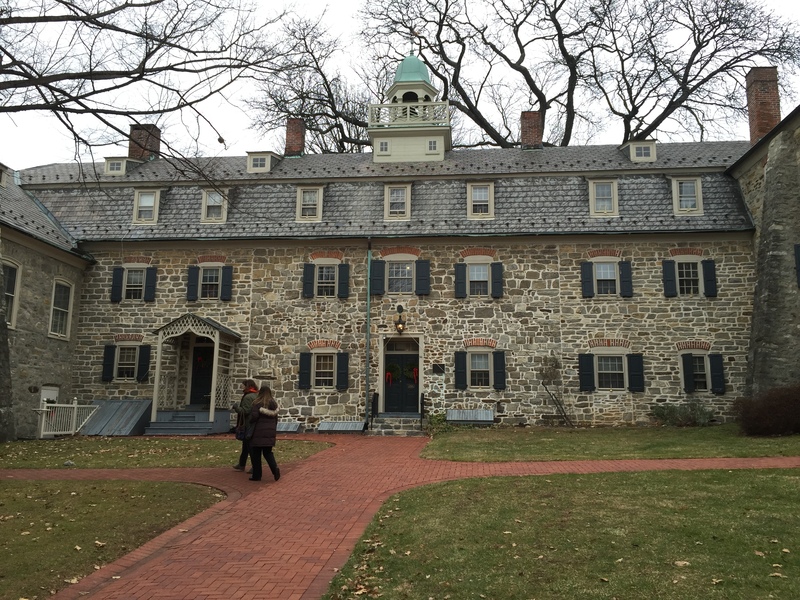 The Moravian Church has long had a tradition of emphasizing education for women. And this education manifested in the writing of hymns, conversion narratives, and, of course, poetry—all of which I did not know at the time I encountered the plaque. The mention of the poetry reading makes sense contextually since the Moravian Seminary for Young Ladies is adjacent to the Old Chapel. Since that particular moment I encountered that sign I’ve had a chance to visit other Moravian sites and read some primary and secondary documents related to their history. I’ve learned how important the education of young women was to the Moravians. One reason for this emphasis was so that the young women could write their conversion narratives. In reading these conversion narratives I’ve been surprised to see how many of them incorporated poems. Some of these poems are original works, while others are adaptations of Moravian hymns. Music, especially hymns, is closely related to the Moravians, so an emphasis on poetry makes sense, too. I also know that Bethlehem had an active presence of print culture with booksellers and printers active in the area. But what does an abundance of print culture mean for the manuscript culture likely experienced by these young women? I spent a lot of time over the past semester thinking about the plaque on the Old Chapel as it relates to teaching in my composition classes. The example of the plaque leant itself well to my classroom because students were working on writing projects at one point that looked at the topics of their own community and history. Using the example of the plaque and my initial struggle to think and write about it dovetailed nicely with the class as we covered the early stages of doing an argumentative paper with sources. I frequently used the example of the Old Chapel plaque in my composition class as an example of approaching the nascent stages of a research question. I find that students often grapple with finding a topic, often taking on something too huge to be addressed in a few pages of writing. Additionally, as teachers, scholars, and writers, I think it worthwhile to show students examples of our thinking, teaching, and research process—and, most importantly, our struggles. My interest in the plaque on the Old Chapel is also an example of starting (seemingly small) and focusing on the questions that come to mind. And, for me at least, it is also an example of what happens when we emphasize our own ideas. In this case, I wrote about 1300 words inspired from a single sentence on a commemorative plaque before turning to the relationship of my scholarship to my teaching. That idea: that it does not take much outside material to generate big ideas, is often a difficult one for students to grasp. I think students often feel uncomfortable with using their own voice and ideas, and rely much more on the ideas and words of others. I used this example in class to talk about library sources and using the databases provided by the school. This example gave students a chance of seeing ways around the quandary of “there is nothing about my topic.” As literary scholars we love the idea that there is “nothing about a topic.” The joy that we feel as scholars starting out on a fresh trail often leads us to minimize the fears and concerns from students about not being able to find sources. It is too easy to ascribe to students a lack of sophistication in their research skills and not address the real fears that they have about research and writing. Being forward about in class about the struggles of one’s own work, especially the difficult aspects, has great benefit for students.